It’s been incredibly cold in Ohio for the past month. We were lucky this week to have a business trip scheduled that has brought us to Florida. After finishing up with our work, we decided to add in a bit of vacation. When I checked in this afternoon, the woman at the front desk chuckled when I answered her request for our address. It seems most of the people she’d checked in today were from Ohio. Is it a coincidence that we’ve all just decided that the first part of March is the best time for vacation, or are we all just trying to flee the sub-zero temperatures at all cost? I’m going with the second option! The first couple days down here were fairly chilly and overcast. I had to console myself by looking at the current weather up north. Tomorrow and the day after will be a stark contrast. It will be sunny and in the low 80’s. Those of us who have escaped Ohio will be quick to pull out the tank tops and head out to soak up the rays. The inevitable result of this gluttony will be that some of us are bound to get a sunburn! Vacation sunburns are inevitable when we travel to more tropical locales. Our skin is intended to “warm up” to sun exposure, starting gradually in the spring. It is jarring to take pale skin – whose melanin has gone into hibernation – out into the hot intense sun closer to the equator. Sunscreen may be an option for some, but I have not been comfortable with most brands (except those with zinc oxide as the active ingredient) for some time. Click here for DIY Natural’s Natural Homemade Sunscreen recipe, made with zinc oxide. The blood red oil made from the flowers of this plant are my favorite for sunburn remedy. Ironically, it is accused of causing sun sensitivity. This came about because of a study that noted that cows grazing on the vegetation were more prone to sunburn. From a topical standpoint, it isn’t a good idea to lather up with any oil to go outside in the sun. Use St. John’s wort after a day at the beach and you will avoid blistering and peeling while also soothing the pain in your skin. This is another one that I never travel to the beach without. A splash of ACV over the burnt areas can stop the burn from going any deeper into your tissues. Be warned that you will smell like a salad for the evening though! The best aloe is the juice taken directly from a freshly split leaf. Often the stuff you get from the drugstore in a bottle has other additives. If you must get it this way, try to buy some with the least adulteration. This shy little weed is great for sunburn along with about a million other uses. Make a tea and chill it for best results. Soak a cloth in your tea and drape it over the burnt area. Plantain is known as a drawing agent and it will effectively draw the heat out of your sunburn. If you spend time in the sun, prevention is key! Wear sleeves or big hats. Start your day when the sun comes up and allow your skin to slowly increase its melanin as it slowly heats rather than entering the sun right at mid-day. Find a safe, natural sunscreen. If you get burnt, be sure to have some of these easy remedies in your travel bag, you’ll be glad you do! 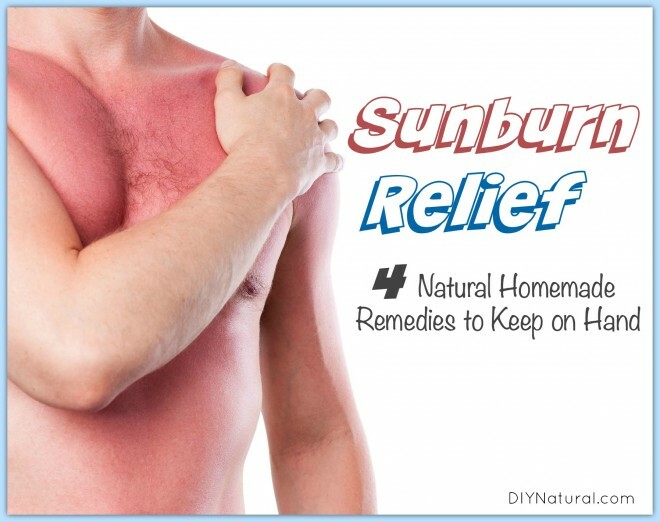 What do you use for sunburn relief? Do you have other ways to prevent sunburn? I married into a decidedly allopathic family, so they lovingly tease me about my “hocus-pocus.” Over the years, though, after having experienced positive results, sometimes now they ask if I have any remedies for different things when we are on vacation together. This is a nice one for sunburn: In a 4 oz. spray bottle add water, 1 TBS. aloe juice, 3 drops lavender essential oil, 2 drops chamomile essential oil and 2 drops peppermint essential oil. Very cooling and easy to apply. I use the liquid from inside a Vitamin E pill. If you have a sunburn on your face, and you go to sleep with vitamin E pill liquid smeared on your skin, the burn will be 70-80% gone in the morning. IT. WORKS. I use plain, store-bought coconut oil, not even the expensive “extra-virgin, cold-pressed” stuff. For several years, all I ever bought was LouAna brand, from Walmart, using it for cooking and for skin care. I apply it to exposed skin BEFORE going into the sun because it has a low natural SPF and I find that it really works better than any ‘sunscreen’ I’ve ever used. My husband and I spent nearly a week at a resort in the Yucatan Peninsula of southern Mexico, in January of 2005. I applied my coconut oil every day before going outside in the sun, never incurring a burn – EXCEPT for the day we went touring the Mayan ruins and floating on the Xel-Ha River, and boy, did I ever pay for it! My legs were flaming red and hurt like crazy. I stopped at a kiosk and bought a bottle of sunburn relief lotion that contained aloe and other good stuff, but had almost no relief from the pain. When we finally returned to the resort, I headed straight for the coconut oil and slathered on a couple layers of it. BY THE TIME I FINISHED THE PAIN WAS GONE!!!!!! I could slap my burned areas and felt no pain! When we went dancing that night I wore a red dress that perfectly matched my skin color. People were cringing in sympathy at my scarlet legs, but I showed them that they didn’t hurt when I slapped them, solely because of the coconut oil I had used. I made a lot of converts on that trip, and when the burned skin finally peeled, the peeling was minimal. In the years since that trip, I have continued to use the cheapest coconut oil I can find, for both cooking and skin care, and I love it. Now my favorite way to use coconut oil in the summertime is to keep some in a small bottle with a few drops of oil of peppermint added, to repel mosquitoes, no-see-ums and other pesky bugs. I apply it every 3-4 hours to all exposed skin and I seldom burn or am bothered by the bugs. Coconut oil melts at such a low temperature and responds so well to soap, it washes out of clothing very easily. I’m also using coconut oil in salves I make, along with olive oil, balm of Gilead (resin soaked out of cottonwood buds – Populus deltoides), beeswax, calendula petals, and other healing herbs. Wonderful information! Thank you for sharing.